AL Player of the week Paul Konerko hits a home run against Minnesota last Wednesday. Ryan Dempster takes the 1-0 loss at Pittsburgh with Jeff Baker and Tony Campana. Teams have peaks and valleys during baseball’s 162-game season. White Sox General Manager Ken Williams believes you can’t measure the season until June 1st. That is just a few days away, so we’ll take a look at the Cubs and Sox seasons as they stand now. Pre-season expectations for both teams were not very high, but there is always hope that maybe some players may have a career year and give surprising results. For the past few weeks the White Sox have played remarkable baseball, winning 11 out of 12 games and 7 in a row. The Cubs just ended a prolonged 12 game losing streak by beating the hapless Padres at Wrigley Field and finally got their first series sweep of the year Tuesday against San Diego. 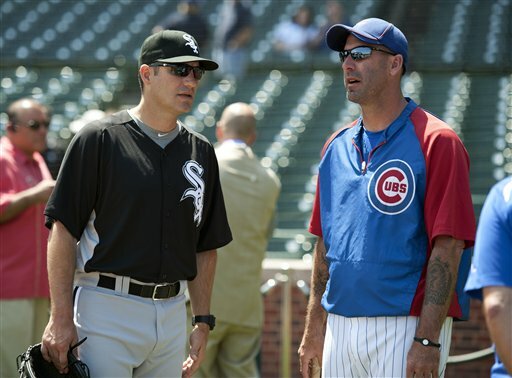 What’s working for Robin Ventura and the White Sox and what are the issues with Dale Sveum’s Cubs? Rookie manager Robin Ventura has been even-keeled while running a major league team for the first time. He has not been too “up” during this streak and wasn’t “down” when the team struggled. Hitting Coach Jeff Manto knows the torrid hitting will cool off and his job will be to reassure his players. Right now, the easiest job for Manto is having Paul Konerko, a consummate baseball player; he continues to improve on his numbers. “People love him, he is wonderful to watch,” says Manto, “he pays attention to video, to scouting reports, to coaches and most of all, his team.” The Sox first baseman has been on a tear, leading the American League with nearly a .400 batting average. Tuesday, he was named AL player of the week for the second time this season. Besides Konerko, AJ Pierzynski is the AL’s best hitter, with runners in scoring position and Adam Dunn clubbing homers again. Now Manto’s other pupils have picked up the slack. In the past few weeks, the batting averages of Dayan Vicedo, Alejandro DeAza, Alex Rios and Gordon Beckham have all improved. Pitcher Chis Sale and his agent pushed the team to keep him in the starting rotation and not be the club’s closer. He has been brilliant, one of the league’s top ERA leaders and coming off a 15 strike-out performance against Tampa Bay on Monday. Sale and Jake Peavy are league leaders in several pitching categories. There are concerns over the inconsistencies of starters Gavin Floyd and John Danks (presently on the disabled list). Phil Humber’s win over the Rays last night was his first since the perfect outing. How about the Sox picking up San Diego’s discard, Orlando Hudson? He is filling in for injured third baseman Brent Morel. Hudson has won Glove Gloves at second but is playing the “hot corner” for the first time in the majors. Morel is expected back soon and it will be up to Ventura to make the decision on which player gets the nod at third. After failing with pitchers Matt Thornton and Hector Santiago as closers, the team has landed on rookie Addison Reed. His powerful arm and poise have been impressive. There is no guarantee he will sustain this success but it has been part of the reason the White Sox are winning. The key questions: Will GM Williams acquire players if the team is still in the hunt by the end of July? Will the fans finally show up at U.S. Cellular Field? Rookie manager Dale Sveum breathed a big sigh of relief after winning the last two games. He liked his team’s attitude during the rough times. “The one nice thing, this clubhouse was the same as when we played well,” he says. One problem for the Cubs has been behind the plate. Five different starting catchers: Geovany Soto, Steve Clevenger and Wellington Castillo were all injured. The Cubs were forced to trade for Koyie Hill from Cincinnati and bring up Blake Lalli. Clevenger has just returned and Soto is expected back soon from his knee surgery. Cubs first baseman Bryan LaHair has to make adjustments since the scouting report (according to an opposing coach) said he is vulnerable to pitches high-inside. Monday he collected three hits, but prior to that game he had only eight hits in the previous 15 games. Starlin Castro has continued to hit and David DeJesus is quietly doing a good job leading off. Alfonso Soriano has had some nice contributions but not enough for his salary. The team’s flaws were magnified during the losing streak. When your best pitcher, Ryan Dempster, has the unbelievable ERA of 2.14 and has no wins something is really wrong. The lack of run support has been mind-boggling. Yesterday, Jeff Samardzija picked up his 5th win and also contributed with an RBI single when the Cubs won 5-3. The rotating closing situation has been a huge issue for Sveum: Carlos Marmol-demoted and Rafael Dolis-sent to Iowa. So it’s either James Russell (he earned his first career save Tuesday), Shawn Camp or possibly Casey Coleman. Prior to Monday’s game, both President Theo Epstein and GM Jed Hoyer held court with the media about the Cubs present difficulties. Next week will be one of the most important steps the new management team will be undergoing-the amateur draft. The key person will be Senior VP of Scouting and Player Development, Jason McLeod. He had plenty of success drafting for Boston and most recently San Diego. The Padres are considered one of the top farm systems in Major League Baseball. But this is not a quick fix, so the operative word for Cubs fans is patience. 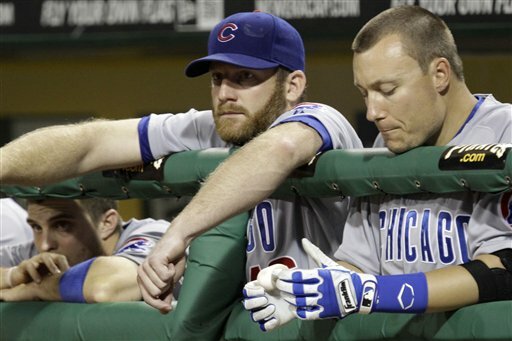 The key question: Will the Cubs trade Dempster? He is a free agent at the end of the year and his value as a starter may garner some prospects. Will the fans continue to support the Cubs is the losses pile up?